For a lot of metal heads, especially ones like me who love atmospheric black metal, melody is ever so important as it really brings the music to a whole new level in terms of atmosphere and depth. Within a song, a melody can tell a story, express emotions, and lead the listener on a journey though the music. When you have vocals in your music, they typically take the forefront and the instrumental melody takes a backseat, letting the actual words do the story telling. When a band can ditch vocals altogether and still express what they want to be felt solely though instrumentation, that is when you know you are doing something right. Musk Ox is a Canadian Neofolk group was formed back in 2005 by founding member Nathanael Larochette. After experimenting for a while, the debut, self titled album was released with a warm reception in 2009. This grew their fan base rapidly, even drawing attention from bigger names in the music industry in, giving them the exposure they deserved. Now, after a 5 year wait, the 2nd full length, Woodfall, is finally released and while in the same vein as the first album, the exquisite piece of pure beauty is leaps and bounds ahead of anything they have ever done in the past. While the first album featured instruments like the piano and a flute, all centering around a classical guitar, Woodfall changes gears a bit to a more 'wooden' tone. Utilizing only three instruments, Cello, Violin, and guitar, Woodfall features stunning, introspective music that blends nature's surroundings with folk-influenced music, performed entirely by acoustic instruments. The music has a many different 'moods' that occur throughout. At points, you are overwhelmed by happiness and joy while at others, you feel very calm and tranquil. Never do you experience feelings of fear or sadness, as Musk Ox creates relaxing music. When listening to this album, you never get the full effect with just one playthrough. Every time I listened to it, I noticed a little melody, a new harmony, or a different pattern that I missed the last time. I love the feeling of knowing that when I play this album, I will be able to find something completely new somewhere in it! The guitar playing is impeccable. After 5 years of work, every melody, chord, and harmony was expertly crafted and carefully written. The overall tone of the guitar is warm and inviting, never do you have a time where the guitar sounds aggressive. While the main focus of the songs are based around the guitar, what makes the music come to life and sound amazing is the addition to the string parts. The cello brings a full, low sound to the music, supporting everything happening around it. The violin takes the lead quite a bit and leads the songs on with beautiful melodies, often times harmonizing with the guitar. All instruments sound extremely organic and natural, and as far as I can tell, not one digital effect is used to tamper with the music in any way. Musk Ox creates music that is beyond words. Expressing such emotion without words is a feat in itself, but doing it in such a way that you can paint a picture in the listeners mind through the music is another. 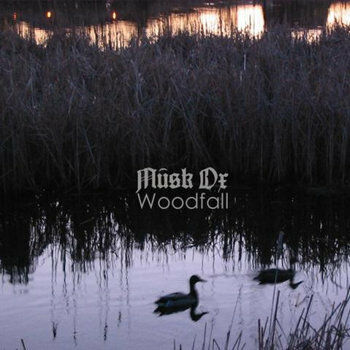 The release of Woodfall only leaves me wanting more from Musk Ox but after seeing what they can do in a 5 year break between albums, I will be glad to wait and see what they have up their sleeves for next time!